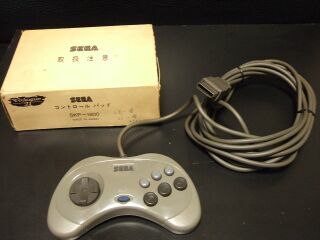 The Sega Prologue Control Pad is an extremely rare peripheral compatible with the Sega Saturn. It is essentially a standard Saturn Control Pad but with a much longer cord - one that's five metres long. Though completely compatible with home Sega Saturns, the Prologue Control pad was not designed for the console. Instead, it was designed for the extremely rare Sega Prologue 21 karaoke unit.